Topics: Spacious Van, and Hints And Tips. It is hosted by Simply Transit Ltd (England, Berkshire,) using Apache web server. 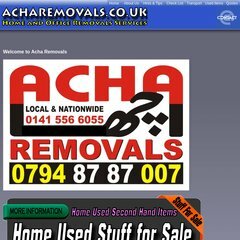 Acharemovals.co.uk's server IP number is 85.234.133.139. It has 2 DNS records, ns2.webserver25.com, and ns1.webserver25.com. PING (85.234.133.139) 56(84) bytes of data.